I’ve been reminded of the old adage ‘use it up, wear it out, make it do, do without‘ recently, especially the make it do or do without part. We have always been good at using it up and wearing it out- watering down shampoo and wearing un-presentable clothes out in public have long been frugal habits of mine. Lately however we’ve been confronted with real debt-reduction dilemmas. Remember how I organize my small kitchen? Well the task has just gotten a bit easier lately, thanks to the microwave’s recent demise in a shower of sparks. Even just a few months ago I would have been quick to run out and buy a new one the next day. But now, in fact, I’m looking forward to seeing how long I can do without a microwave. True, it does require a bit more forethought on my part. I can’t just zap some veggies as I throw together dinner at the last moment. On the other hand, with my recent efforts to reduce my grocery bill, I have to put a bit more thought into what I’m making for dinner anyway. This planning just folds in nicely to my larger goals. Our dishwasher, however, potentially creates a bigger problem. It’s been cantankerous of late, making ominous groaning and squeaking noises; the other day it washed dishes for five straight hours before we figured out what was going on. 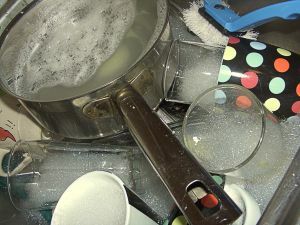 While the dishes were squeaky clean at the end, that’s exactly the sort of thing that plays havoc with the water bill, adding yet another expense. I’m not about to go without a dishwasher, certainly not with three young kids. Not to mention that, given the size of our water heater, washing dishes by hand rapidly depletes the hot water supply and makes it near impossible to have a hot bath or shower afterward. No hot showers in addition to no dishwasher- no thank you! So I’m sure you’ll agree that making the dishwasher do has become a high priority. We bought it used, three years ago, when it was three years old. It’s a good brand and theoretically it still has some life left in it. My husband spent the afternoon fiddling with it and I’ve been doing research into known problems. I will call out a repair person as the next resort. We want this dishwasher to last as long as possible; with our plans to move back to the US in the next few years, we really don’t want to buy a new one. What do you do when your appliances stop working? I haven’t had a microwave since back when I lived with my mother. She was bent on feeding us food that came from the freezer or from a box. Deep breaths! Who needs modern science? Nice job distinguishing a real need from a want. I agree. . . I can make do without a microwave, but a dishwasher is worth every penny! We’re so dependent on the microwave and the dishwasher, but if I had to choose one, I’d choose the dishwasher! I had to talk my husband into getting one, but now that we have it, even he loves it. You can try posting details of your problem at Fixya.com, and you may get someone who is able to tell you how to fix it. I don’t think I would want to live without my dishwasher or my microwave! I prepare meals in the microwave, which uses a lot less energy than turning the oven on, and I also use it to heat up leftovers. The dishwasher I love because it uses less water than washing all the dishes by hand and it sanitizes them. I also hate standing there for so long washing dishes by hand. I guess we all have to draw the line where it’s right for us. Some people might not find these appliances necessary to their lifestyle at all! Betsy Bargain´s last blog post..Good, Cheap Food, And That’s No Crock! Kelly, I pop in here to read now and again and came across this post from your sidebar. “Frugal” being your word, I cannot believe that you are having a dilemma about microwaves and dishwashers? A frugal person would get rid of both of them! microwaves are known to remove nutrients from certain foods, not to mention the electricity they use – thats a no brainer – don’t use them full stop. Dishwasher? – I am puzzled by this, a dishwasher (even a second hand one) uses a large amount of electricity, especially in heating the water up, far more than a back boiler/water heater would. as regards its water useage, I am assuming from this you are on a water meter? if so, why? non water meter users pay a flat fee, I don’t need yet another service provider analysing my home useage, to find new ways to increase profits for shareholders, whilst cutting back on what they are obliged to provide in the future. Fill the sink with water and top up from kettle if needs be, and wash by hand. If you wash pots as you go, there are no stubborn stains to scrub off and washing pots is easy, regardless of family size. Deano…´s last blog post..comparethemarket.com | what are they up to? I just wanted to say that a great resource is your local ‘freecycle’ thru yahoo groups, you could probably find help to fix your dishwasher or a new used dishwasher. And for that person who said dishwashers aren’t frugal, it has been said that using a dishwasher is actually more economical than washing by hand, and when we had a electricity spike because an avalanche wiped out our electric towers we were switched to deisel fuel and told by our electric co. to NOT wash dishes by hand, but rather use the dishwasher.